Facebook is officially in a bear market, with s hares at their lowest levels since July 2017. The FTC confirmed an investigation into the company’s privacy policies amid the unfolding Cambridge Analytica scandal on Monday, sending shares reeling. 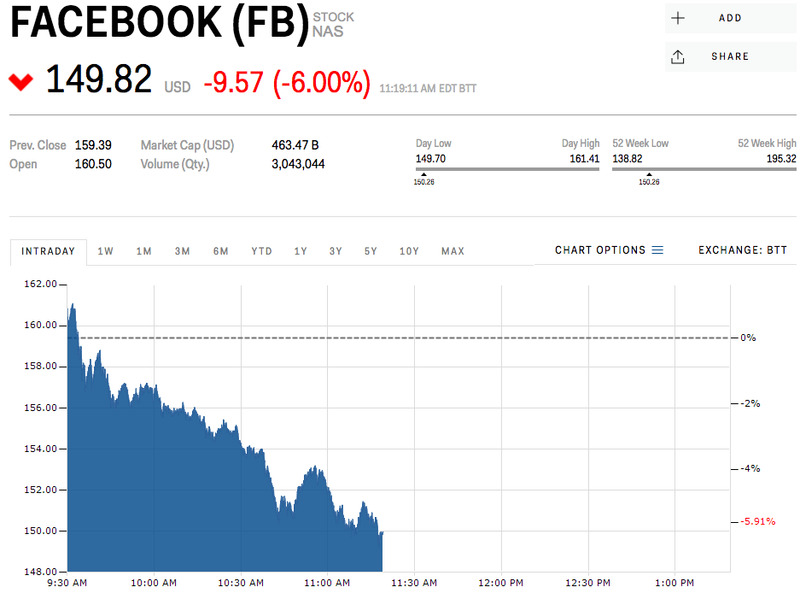 Facebook is officially in bear market territory, down more than 20% from recent highs, as the FTC confirms a probe into the Cambridge Analytica data privacy scandal. Shares are down more than 6% on Monday to an intraday low of $US149, the lowest the stock has been since July 7, 2017. The stock has gotten crushed in the past week by news of a massive data scandal involving millions of users’ account data being accessed by political research firm Cambridge Analytica, a subsequent FTC probe into the company’s data information sharing, and ultimately, long-term concerns over user growth and government regulation. Facebook shares hit a peak of $US195.32 on February 1, but have since fallen off, at first because of a broader stock market correction and fears of stagnating growth. 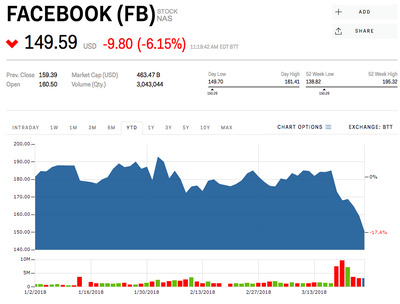 But since the data breach news broke in March, along with further news of an FTC investigation, shares have tumbled into bear market territory. Facebook is down 17% year-to-date.